On Sunday, millions of people around the world will enjoy the sight of a “blood moon”, as a lunar eclipse combined w/a “supermoon” combines to make our natural satellite appear red in colour. Observers might not enjoy themselves quite so much, however, if certain prophecies turn out to be true & the phenomenon heralds the beginning of the apocalypse. Sunday will be the 4th appearance of a blood moon over the last 2 years, in what is known as a tetrad series. The last time was in 1982; the next will be in 2033. If some religious leaders are to be believed, none of us will live to enjoy that next blood moon. Most such leaders are of groups on the fringes of organised belief, although this week leaders of the Church of Jesus Christ of Latter-day Saints felt moved to reassure those among its followers who are worried. Irvin Baxter runs Endtime Ministries in Plano, Texas. He posts regular YouTube videos speculating over whether this series of blood moons could signal the end of the world. “Some prophecy teachers are declaring boldly that this tetrad just ahead signals that something is getting ready to happen, which will change the world forever,” Baxter said on his website. God has often used “the heavens” for sending signs to mankind, Baxter says. He quotes Genesis, in which God says there should be lights in heaven & says of those lights: “Let them be for signs.” Baxter also points out that 3 wise men were led to the birthplace of the baby Jesus by star – a sign in the sky. Baxter warns that previous tetrads have had stark consequences for Jewish people. The Spanish inquisition took place before the tetrad of 1493-94. The tetrad of 1949-50 occurred just after the founding of Israel. The tetrad of 1967-1968 occurred as the 6-Day War was fought in Jerusalem. The current tetrad, Baxter predicts, will precede the signing of a peace agreement between Israel & Palestine. This, in turn, will “mark the beginning of the Final 7 Years to Armageddon & the Second Coming of Jesus to the earth”. Others believe the blood moons do signal the end of the world, but that we have a while left before the 4 horsemen arrive. Mark Biltz, of El Shaddai Ministries, is in that 2nd camp. He has been cited online as believing the end of the world is nigh, but refutes that & believes we have some time yet. Biltz is locked in a row w/Pastor John Hagee, who runs John Hagee Ministries in San Antonio, Texas. Biltz claims to be the “discoverer of the blood moons phenomenon”. He is on record as far back as 2008 as saying the current tetrad could signal major change. Hagee has risen to prominence by making similar claims, however, & published the book Four Blood Moons in 2014. It went on to be something of a bestseller in the US, spending 152 days among Amazon’s 100 top-selling books. But Biltz says he was the 1st to predict the consequences of the blood moons. Joseph Farah, the publisher of Biltz’s own book on the subject – Blood Moons: Decoding the Imminent Heavenly Signs – said in March this year that Biltz had “overlooked a grave slight by Hagee in the way he handled his book – not crediting Biltz as the man who discovered the blood moons phenomenon”. While that row continues, Hagee will spend Sunday hosting a live programme as the blood moon appears. “Pastor Hagee believes this exceptional celestial alignment is consistent w/Biblical prophecy & w/God’s unfolding message to humankind,” promotional material for the show said. 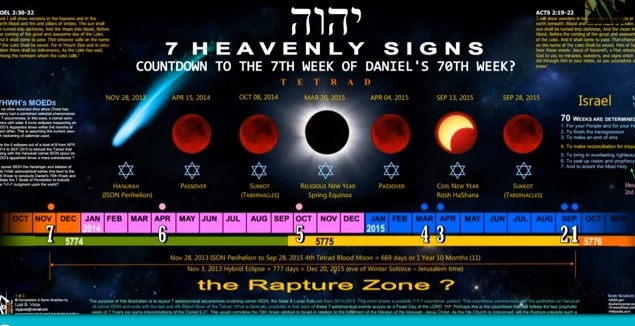 Hagee told the Guardian the blood moon means “an event of historical significance to the Jewish people is occurring or will occur”. Asked what the implications are for the end of the world, Hagee said there were “none”. For anyone concerned that the world may be coming to an end, the views of Nasa should provide calming relief. The organisation has used its website to quell fears of the planet being destroyed, or at least being destroyed soon.